I just saw a facebook entry that said more people are killed in Canada by Moose than terrorists. When you first read this, it just seems impossible. After all, what could possible get moose…mooses…miises…moosii angry enough to take the life of a Canadian? We are a pretty harmless country, filled with polite farmers, foresters, miners, oilmen and politicians that think they are important. I know, you couldn’t blame a moose for wanting any politician dead, but pretty much everyone else is harmless. I then realized that we were talking about accidental highway deaths, not premeditated, homicidal ruminants. 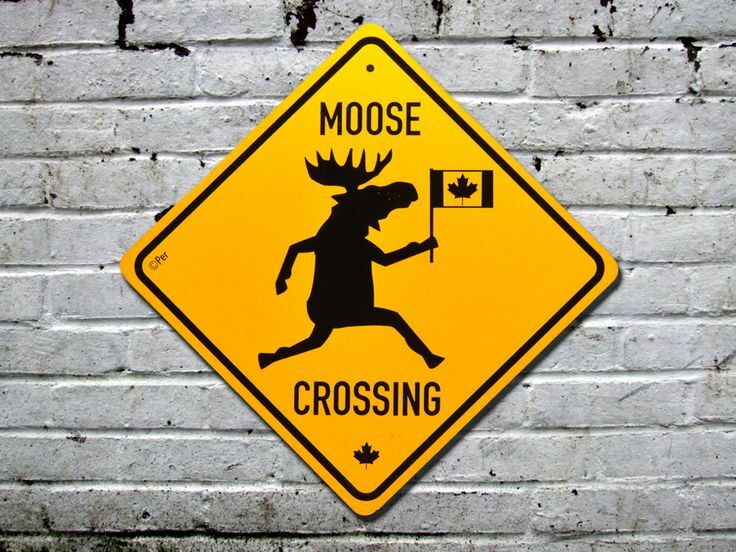 This I can believe since there are estimated to be between 500,000 and 1,000,000 moose…mooses…miises…moosii in Canada and they are notorious for ignoring highway signs telling them where they should cross. When I was little, my mom and dad rented out the basement to a young couple. He was a drummer and she was a drummer’s wife. Back in those days only one person needed to work in a family to get by. They owned a red VW Beetle which was a very cool looking car from the perspective of a five year old boy. I can’t remember how long they lived with us, but a couple of years after they moved out I can remember my mom crying because they had died. It turns out they were driving in Northern Ontario at night and ran into a moose on the highway. The car was so low that the roof was sheered off of the VW by the moose and that nice young couple were decapitated. I still remember a comment my dad made to us boys afterwards. “This wouldn’t have happened if they had bought a domestic car.” I’m not sure dad learned the most important lesson here and I doubt that anything short of a tank would have protected them. To me it just proves that you shouldn’t drive in Northern Ontario at night…in a foreign car. I was just sitting here wondering if anyone had been killed by mice. Certainly not while driving a car either foreign or domestic. I imagine that at some point in the history of mankind it has happened, but how? Perhaps someone might be startled and if they had a weak heart, it just might cause a heart attack. I bet those little buggers carry some disease that would weaken or kill a healthy human. I don’t think mice are known to swarm, but if thousands of mice swarmed you, they just might kill you. If that happened I know I would have a heart attack. I just watched a video of millions of mice attacking a farm in Australia. They were eating the pigs while they were alive! Jesus!!!! So, mice can kill you for sure.